Packaging is one of the things that can make your CD or DVD project stand out from the crowd. At MAD CDs we specialise in unique packaging options that won't break the bank. You can view some of our packaging options in the gallery below, we are always adding new images to the gallery and we have many other types of packaging available beyond what you see here. If it's not pictured - don't despair - just ask if we have a sample! Almost all of our paper packaging (booklets, wallets and digipacks) are available in recycled material. We can also source jewel cases and trays made from biodegradable materials. Check out our Green Page for more information. If you can't find anything you like don't worry! We can create packaging specifically for you. Please contact us to obtain a quote or discuss other ideas. Hard Case Packaging - traditional jewel cases and DVD boxes. We also do DVD and CD cases to hold multiple discs. 5 inch wallet - great for mailing out, promotions and singles. 5 inch wallet with tie closure - this sample uses kraft stock. Other stock types are available. Single arc pocket 'Lavelle style'. Sample shown in standard gloss stock. Other stock available. Triple pocket wallet, six panel gatefold wallet. Sample shown has matt cello finish over standard stock. Standard four panel digipack with single clear tray. Sample shown on standard stock. Six panel digipack with two clear trays and 1 slit pocket in centre panel. Sample shown has matt cello finish over standard stock with silver foiling. Hinged lid box with gloss finish. Box holds 5 inch wallets and booklet. Large format book with gloss cover and rear swing pocket for disc. Custom-made wallet to hold booklet and disc. Booklet has 'comic book' stock in centre. Package enclosed in clear resealable cellophane bag. Padded box with ribbon tie closure to hold 3 padded books. Brown debossed text. Cloth bound. 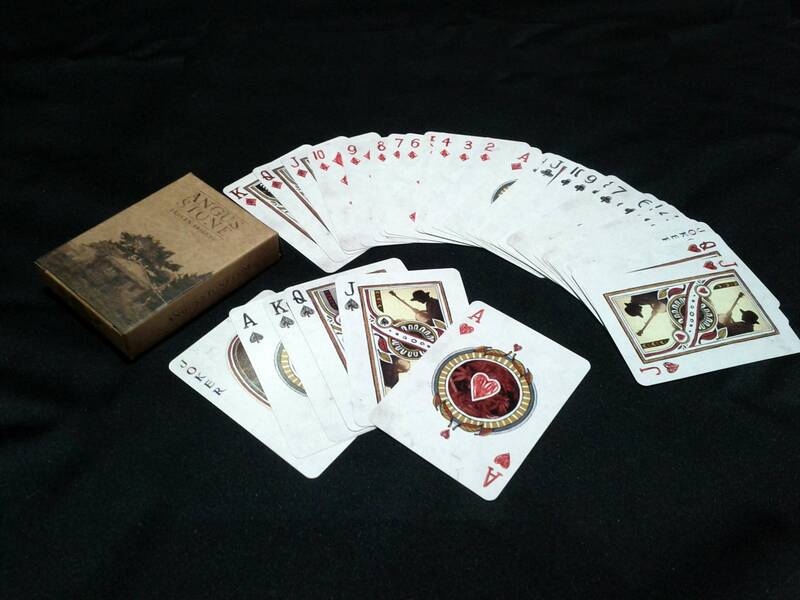 Customised playing cards and box - customise the back and front or just the back.